Glow-in-the-dark mushrooms? Is that a real thing? Yep, it is. And no, you’re not tripping. 1. There are over 80 species of bioluminescent mushrooms found on earth. 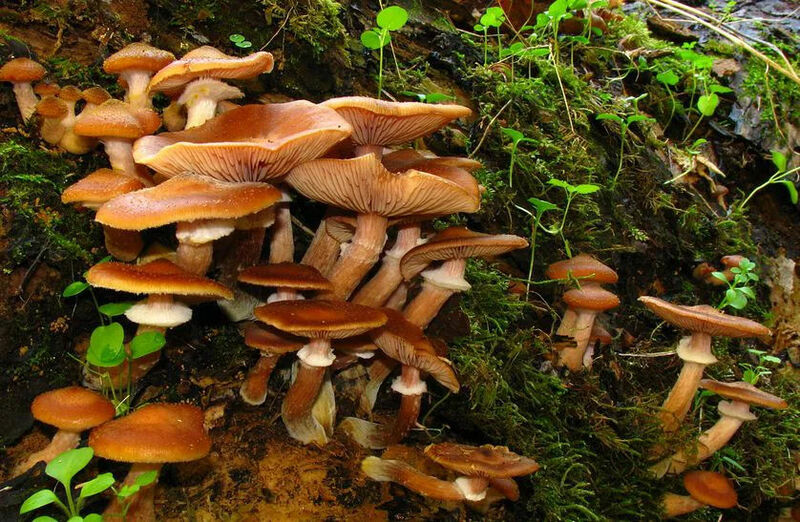 Armillaria mellea is the most widespread of the bioluminescent fungi because it populates forests throughout North America and all the way over to Asia. Another example called Mycena luxaeterna (also known as the “eternal light mushroom”) is a rainforest fungus and can only be found in Brazil. 2. Oxyluciferin is the magical compound found in bioluminescent mushrooms and gives the fungi their radiance. The mushrooms use a class of molecules called luciferins, which paired with an enzyme and oxygen, release light. 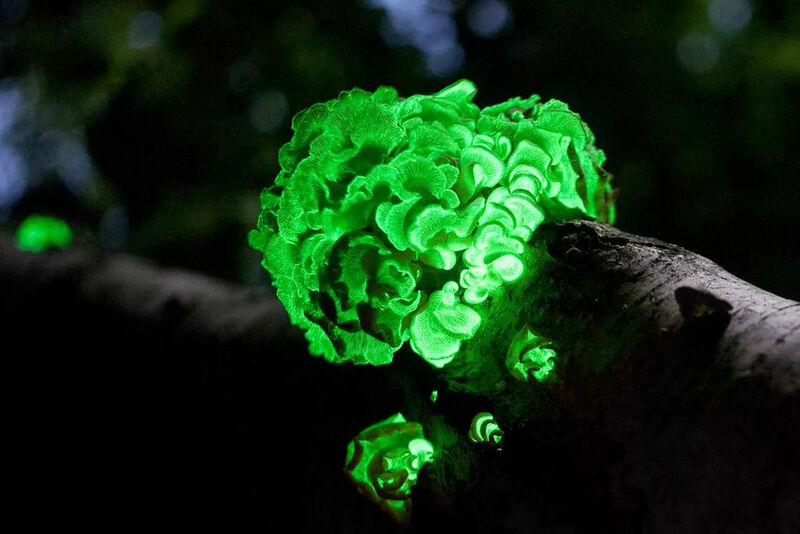 Panellus stipticus (also known as the bitter oyster) is one of the brightest-glowing examples of bioluminescent fungi. It is found throughout Asia, Australia, Europe, and North America. These flat mushrooms grow on tree branches creating a mesmerizing effect as soon as the sun goes down. Foragers are able to find this variety growing around birch, oak, and beech trees. 3. The luciferins found in bioluminescent mushrooms are the same compound found in fireflies and underwater creatures. 4. Over 100 years ago, naturalist George Gardner saw children playing in the street in Brazil with what he thought were giant fireflies. They were not insects at all. The children were playing with large, glowing fungi. Today, this species is known as Neonothopanus gardneri. This fungus grows throughout Brazil. 5. Bioluminescence in varieties such as N. gardneri follow the circadian clock. This is because of luciferin, reductase, and luciferase (which together create luminescence). All three peak at night due to temperature changes. 6. Aristotle recorded bioluminescence as far back as 382 B.C. He referred to the phenomenal fungi as “Foxfire” (later called fairy fire or chimpanzee fire) and recorded that unlike fire, the light of Foxfire was cold to the touch. 7. You can find bioluminescent mushrooms most easily during the daytime. 8. 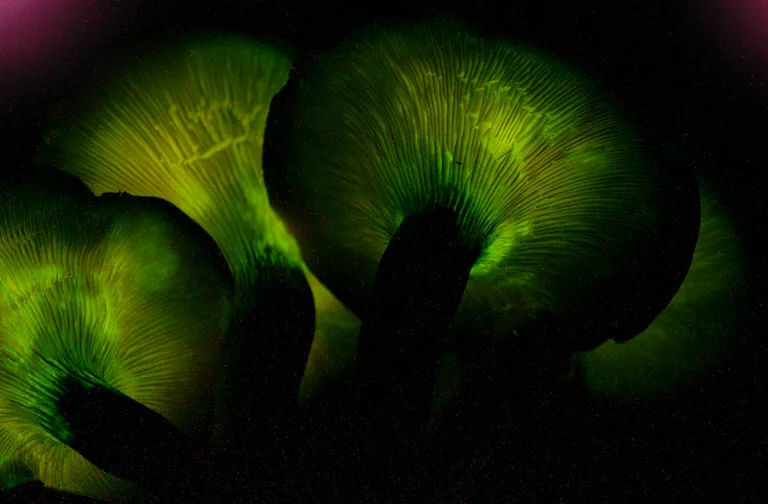 In a study from 2015, scientists unearthed why most bioluminescent mushrooms glow. By planting fake fungi lit by LED lights in the Brazilian Coconut forest, they saw how bioluminescence attracts swarms of insects (not unlike a moth to a flame). Attracting insects is essential for fungi to spread its spores. 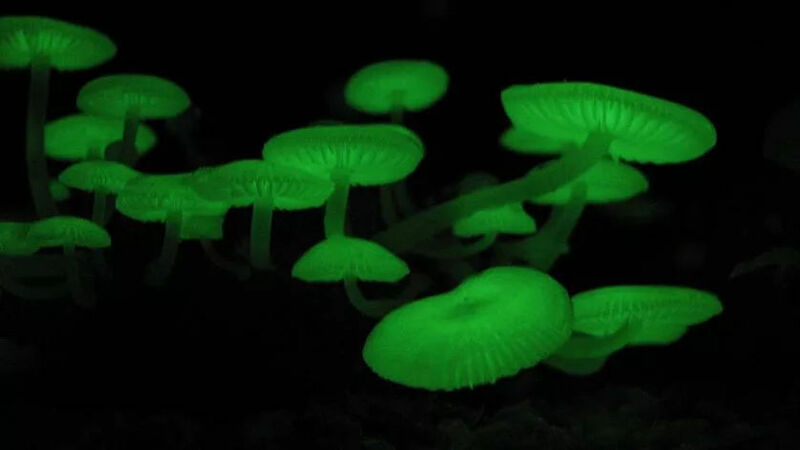 The bioluminescent mushrooms then reproduce and colonize new areas of the forest as food sources. 9. Other studies show that not all bioluminescent mushrooms attract more insects. This is the case for Australia’s Ghost Fungus. Scientists from the University of Adelaide found that insects were not attracted to traps of the glowing mushrooms any more than traps without the mushrooms. More study is needed to unlock the advantages of glowing fungi. 10. Our understanding of the details of the mechanics behind bioluminescent mushrooms remains scarce. There is still a lot of mystery behind the whimsical, strange, and radiating fungi of the forest. More time and continued scientific study will illuminate our understanding of bioluminescent mushrooms. Have you ever come across bioluminescent mushrooms in the forest? We’d love to hear your stories of foraging and discovery in the comments!